Jake Riding tossed a 2-hitter to lead the Pahrump Valley High School baseball team to an 11-1 victory over Valley on Monday in a Class 3A Sunset League game in Pahrump. Horace Langford Jr./Pahrump Valley Times The Pahrump Valley High School baseball team sandwiched two mercy-rule Sunset League victories around a 1-run loss to Green Valley last week. The Trojans are 9-4 this season, 2-0 in the league. Horace Langford Jr./Pahrump Valley Times Kaden Cable slides safely into third base during Pahrump Valley's 28-5 victory over Valley on Monday at Floyd Field in Pahrump. Senior Tyler Floyd went 2-for-3 with 2 RBIs and 2 runs while Joey Koenig had three hits, including a double, drove in a run and scored twice for the Trojans, who erupted for eight runs in the bottom of the fourth. Willie Lucas and Reace Millette each doubled for Pahrump Valley (9-4, 2-0 Sunset). Valley fell to 3-7, 1-1. On Saturday, Cyle Havel went 2-for-4 with two doubles and four RBIs, Koenig went 3-for-4, and Millette was 2-for-4 with 3 runs, but the Trojans gave up a two-out, two-run double in the bottom of the sixth that gave Green Valley (6-6) a 7-6 win over the Trojans. 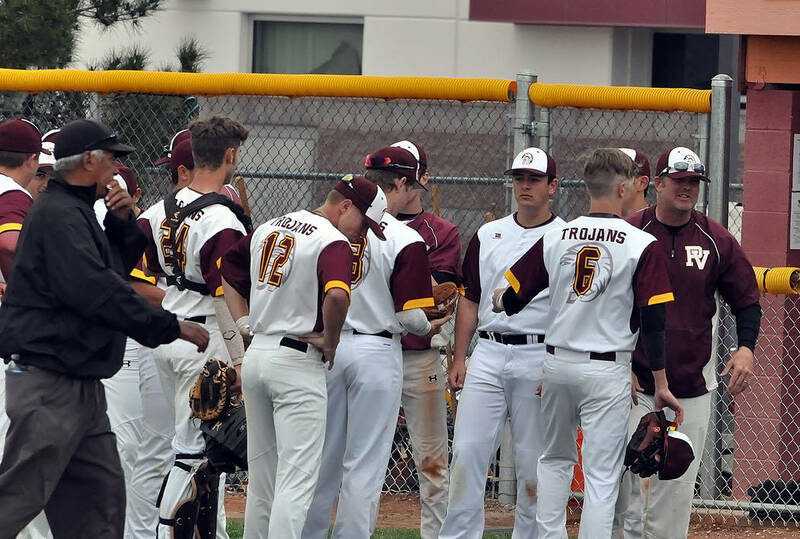 On Thursday, the Trojans gave Democracy Prep a rude welcome to Class 3A baseball with a 20-0 rout. Lucas homered, doubled and drove in 5 runs in the three-inning victory. Chase McDaniel was 3-for-3 with a triple and 2 RBIs, and Millette was 3-for-3 with a double for Pahrump Valley. Riding tossed a two-hitter and struck out nine. 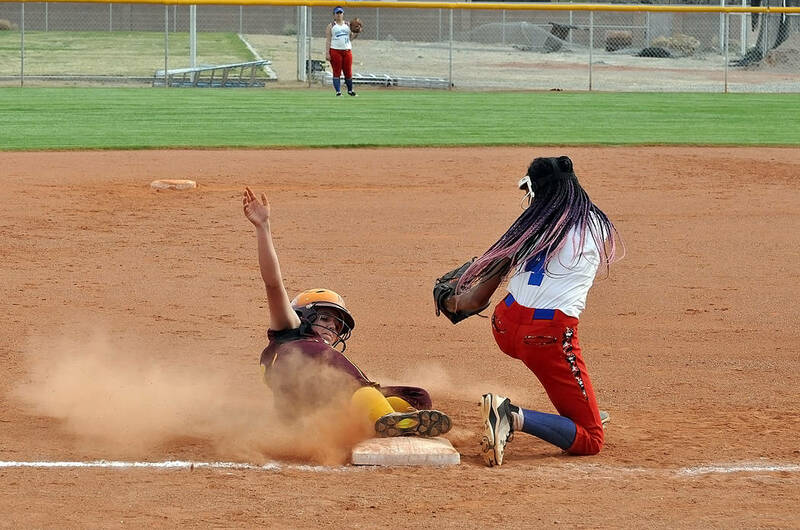 Natalie Waugh-Magana had 3 hits and 4 RBIs, while Jackie Stobbe contributed 3 hits, including a home run, and 3 RBIs as the Pahrump Valley softball team pounded Valley 28-5 in three innings. The Trojans (13-6, 2-0 Sunset) pounded out 22 hits, while the Vikings committed 7 errors. Pahrump Valley scored 11 runs in the first inning and 17 in the second, while Valley (2-12, 1-1) scored all of its runs in the top of the first. On Saturday, Kareena Nelson went 2-for-3 with a run and an RBI, but the Trojans dropped an 11-2 decision to Green Valley in Henderson. Olivia McClain went 2-for-4 with a home run and four RBIs to power the Gators (8-4-1) by the Trojans (12-6). Kareena Nelson threw a three-inning no-hitter with 7 strikeouts Thursday as the Trojans rolled past winless Democracy Prep 16-0. Five Trojans posted top-10 finishes at the competitive Blaine Thompson Las Vegas Classic on Friday and Saturday at Desert Oasis High School, while several more set personal records. Senior Chance Farnsworth placed second in the boys high jump, clearing a personal-best 6 feet, 4 inches. That stands as the top mark in the state among Class 3A athletes. Junior Grant Odegard placed eighth in the pole vault at 11-6, and his earlier mark of 12-0 at a Pahrump Valley Weekday is also the state’s best. On the girls side, junior Kylie Stritenberger took seventh in the shot put (31-6.5), her top mark of the season. Sophomore Taylor Williamson’s 7-0 pole vault effort was good for eighth place, while senior Elaina Dattilio finished ninth in the high jump at 4-6. Senior Dee Brown’s 33-9.5 distance in the boys triple jump was a personal best, as was Arianna Hamilton’s time of 19.40 seconds in the 100-meter hurdles. Roundy ran the 400 in 1:12.80 and the 800 in 2:48.85. The Trojans hosted the third Sunset League match of the season March 27 at Mountain Falls, and the results were predictable: Western’s Jared Smith was outstanding again, firing a 2-under 70, and the next four spots were all held by Pahrump Valley golfers. Kasey Dilger (87) and Koby Lindberg (88) paced the Trojans, as Dilger recorded one of only two birdies by Pahrump Valley golfers while parring eight of 18 holes while Lindberg parred seven holes, including three of the first four. Trevyn Wombaker finished fourth with a 93, and Caleb Sproul took fifth at 95. Sproul was especially strong on the front nine, making the turn at 7 over, a shot behind Dilger and even with Lindberg. With the top four golfers for each team counting in the scoring, Pahrump Valley crushed Western, shooting a 75-over 363 to beat the Warriors by 73 strokes.